Bulk Load is a special type request used by bulk insert operations, like the bcp.exe utility, the IRowsetFastLoad OleDB interface or by the SqlBulkcopy managed class. Bulk Load is different from the other requests because is the only request that starts execution before the request is complete on the TDS protocol. this allows it to start executing and then start consuming the stream of data to insert. The above mentioned task created to handle the request will represent the request from beginning till completion. For example if the request is a SQL Batch type request the task will represent the entire batch, not individual statements. Individual statements inside the SQL Batch will not create new tasks. Certain individual statements inside the batch may execute with parallelism (often referred to as DOP, Degree Of Parallelism) and in their case the task will spawn new sub-tasks for executing in parallel. If the request returns a result the batch is complete when the result is completely consumed by the client (eg. when you dispose the SqlDataReader). You can see the list of tasks in the server by querying sys.dm_os_tasks. Once a query plan is chosen by the Optimizer the request can start executing. The query plan gets translated into an actual execution tree. Each node in this tree is an operator. All operators implement an abstract interface with 3 methods: open(), next(), close(). The execution loop consists in calling open() on the operator that is at the root of the tree, then calling next() repeatedly until it returns false, and finally calling close(). The operator at the root of the tree will in turn call the same operation on each of its children operators, and these in turn call the same operations on their child operators and so on. At the leaf the trees there are usually physical access operators that actually retrieve data from tables and indexes. At intermediate levels there are operators that implement various data operations like filtering data, performing JOINs or sorting the rows. Queries that use parallelism use a special operator called an Exchange operator. The Exchange operator launches multiple threads (tasks => workers) into execution and asks each thread to execute a sub-tree of the query plan. It then aggregates the output from these operators, using a typical multiple-producers-one-consumer pattern. An excellent description of this execution model can be found in the Volcano-An Extensible and Parallel Query Evaluation System. An operator like HASH JOIN will be both complex and stop-and-go behavior: to build the hash table it has to call next() on the build side child until that operator returns false. It then calls next() on the probe side child operator until a match is found in the hash table, then return. Subsequent calls continue to call next() on the probe side child operator and return on hash table match, until the probe side child operator next() returns false (see Hash Join for a more thorough discussion). The Execution Warnings event class indicates memory grant warnings that occurred during the execution of a SQL Server statement or stored procedure. This event class can be monitored to determine if queries had to wait one second or more for memory before proceeding, or if the initial attempt to get memory failed. Hash Warning Event Class. Strictly speaking things are a bit more complex for hashes (they bail out, not spill), for more details see Hash Warning SQL Profiler Event. For more details about memory grants read Understanding SQL server memory grant. The memory granted to a query is a reservation, not an allocation. During execution the query requests actual memory allocations from this reserved grant and this is when memory is really consumed by the query. Is possible for a query to consume (allocate) less memory than granted (the estimates are usually pessimistic and account for worst cases). Memory that was granted but not consumed is used for data caching (buffer pool). However large estimates (grants) that are not used have a negative effect because they block other queries from even starting execution because of the resource semaphore limit. A somehow related concept is the query compile resource semaphore. This is a similar gate as the execution grate, but it applies to query compilation, not to query execution. Normally this should never be an issue because compilations (should) occur rarely. 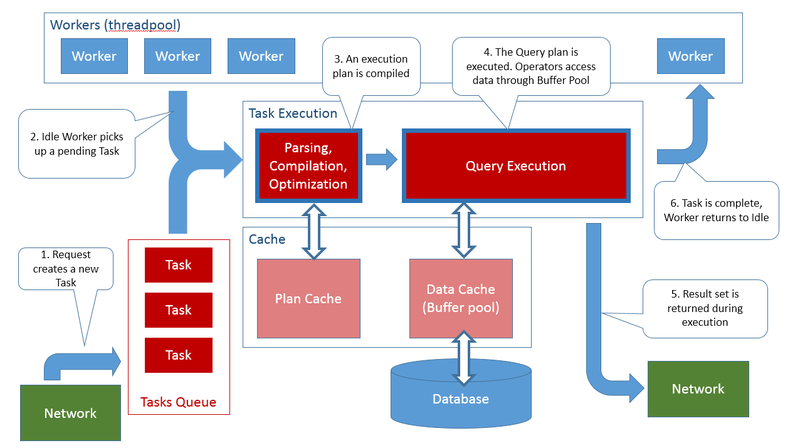 A large number of requests blocked at the query compile gate indicates an issue with query plan reuse, see Diagnosing Plan Cache Related Performance Problems and Suggested Solutions. And a last note on the memory grants: remember that not all queries require a memory grant. Memory grants are needed only by complex queries involving sorting, large scans (parallelism) and hash joins or aggregates (ie. unsorted input, impossible to use streaming aggregates). If you see memory grant issues on systems expected to have low latency (eg. a web site) then is time to reconsider your data model design. Query memory grants are valid in analytic scenarios (large queries where high latency is expected and tolerated). With SQL Server 2012 there is another mode of organizing a data, namely Nonclustered Columnstores and in the next version of SQL Server there will also be a Clustered Columnstore mode. If you’re interested in them read the articles linked. The Scan operator will iterate through all the rows in its source. A scan can never locate a particular row, it always has to scan the entire data set (hence it’s name…). If you inspect an execution plan you’ll possibly see any of the operators for Clustered Index Scan, Nonclustered Index Scan, Table Scan, Remote Index Scan and Remote Scan. They are distinct operators because they apply to different data sources (indexes, tables, remote linked servers) but they all have in common the end-to-end scan behavior. As these operators have to read the entire data, always, they are always expensive. Only data warehousing queries should resort to these type of scans. Scans read all the data. Seek read only the minimum required data. B-Trees can perform seeks only if the leftmost index key(s) are specified. Strictly speaking all the operators used to insert, delete or update rows are also data access operators. The Inserted Scan and the Deleted Scan operators do access data to iterate over the trigger inserted and deleted pseudo-tables. Log Row Scan is a more esoteric data access operator (it reads rows from the log, not from the data tables). But going into this level of detail to explain how these work would derail the purpose of this very article. On first next() call the operator has to find the first row and return it. SQL Server stores metadata about tables that describe exactly which pages belong to a table, for more details I recommend reading Managing Space Used by Objects and Inside the Storage Engine: IAM pages, IAM chains, and allocation units. The data access operator will request a reference from the Buffer Pool for this page which will return a pointer to the in-memory copy of the requested page. If the page is not in memory, the request blocks until the page is read from disk. The page contains an array of individual data records. A record is not necessary an entire row, because large values and variable length values may be stored on another page. I recommend reading Inside the Storage Engine: Anatomy of a record for more details on how rows are arranged on the page. The data access operator will locate the first row on the page, copy out the requested field values and return. The data access operator keeps internal state that allows it to efficiently return to this position (same page and row). Parent operators consume the first row returned by the data access operator. When next() is called again on the data access operator it will use the previously established context state to position itself quickly on the current page and row, advance the row position by one, copy out the requested field values and return. Parent operators consume the next row returned by the data access operator. When next() is called again on the data access operator and all rows on the page have been consumed the operator will request from the Buffer Pool a reference for the next page. Which is the ‘next’ page is determined from the table metadata, and I refer you again to Paul Randal’s IAM article for more details. Once it has the next page the operator returns the first row on this new page (it copies out the request fields and returns). Parent operators consume this row returned by the data access operator. This continues until the last row on the last page belonging to the table is returned. After this the operator has reached end-of-table, it’s internal state is positioned ‘beyond end of table’ and cannot return any more rows. When the data access operator cannot return any more rows the parent operator does whatever action it has to do when the child operators are ‘done’. For example a SORT operator can now start returning rows. A hash JOIN can start iterating the probe side and return rows. A SELECT operator can itself return false and cause further operators up the tree to finish, ultimately causing the query to complete. Data access operators can be rewind. For example if our heap scan operator would be the inner side child of a nested loop operator, when is complete the parent nested loop would request the next row from the outer side child, then rewind our data access operator and iterate it again. Rewinding a data access operator causes it to reset its internal position state and will cause it to start again from the first row on the first page. On first next() call the operator has to Seek (find) the first row that has the key requested and return it. SQL Server stores metadata about B-Trees that describe exactly which pages belong to an index but, unlike the Heap case when it has to go to the first page, the operator has to navigate to a specific key. From the metadata it retrieves the root page id and then request a reference from the Buffer Pool for this page. Using the searched key value, the data access operator navigates the B-Tree too reach the leaf page that contains the first row equal or after the searched key. At each step down the B-Tree the data access operator must request the relevant page from the Buffer Pool and possibly wait for it to be read from disk. On the leaf page the data access operator will have to search the rows in the page to locate the one with the desired key, copy out the desired column values and then return. It is possible that the data access operator does not find a row with the key value searched for. The B-Tree access can request an exact key value for the row, it can request the first row after the key value or it can request the first row equal or after the key value. A B-Tree can be searched in both direction (ascending or descending) so the definition of a row ‘after’ the key depends on the direction of the search. Not that this is not the same thing as having the index defined ascending or descending, which means change the actual order of rows in the B-Tree. If the operator is used as a range scan, then next() will be called again asking to retrieve the row after the previously returned one. The B-Tree access operator would store the key value it returned previously and position itself on this key value, using the same procedure to navigate the B-Tree as described above, and then move to the next row. If there are no more rows on the page then the operator would return the first row on the next page (again, asking for the next page from the Buffer Pool and possibly having to wait for it to be read form disk). In B-Tree organized indexes the pages are linked, each page has on it a pointer (the page id) of the next page. Range scans can contain and end range key value. In such case the call to next() may return false (not return a row) if the row located by moving to the next row from the current position is greater than the range end value. The term ‘greater’ is relative as the range scan can traverse the B-Tree in both ascending or descending order and the B-Tree itself may be organized ascending or descending. The operator can end the scan either when it reaches a key positioned after the end of range value, or when it reaches the last row on the last page of the B-Tree. In addition to being rewind, B-Tree operators can also be rebind. A rewind resets the operator state to start again the seek/scan with the same key/range parameters. A rebind will change the actual key values. See Showplan Logical and Physical Operators Reference for more details. From the description of how scan operators operate you can see that every time they finish reading all the rows on a page they have to ‘fix’ the page into the buffer pool and this potentially can stall the operator as it has to wait for the page to be fetched from disk into memory. If the operator has to stall at every page, performance plummets. The solution is to read ahead pages that are not referenced by the operator now, but will be referenced soon. SQL Server does this and issues asynchronous read ahead requests for pages that will be required by the scan operator before the operator actually reaches that page to read the rows. Luckily by the time the operator reaches that page the page is already in the buffer pool and ‘fixing’ the page is nearly instantaneous. For more details see Reading Pages, Sequential Read Ahead. There exists also a special kind of read ahead for reading random pages for a nested loop, see Random Prefetching. For a detailed discussion about latches read the Diagnosing and Resolving Latch Contention on SQL Server whitepaper. Locks describe the entity being locked, they’re not the actual entity. Locks are 6 byte strings that describe what is being locked. Latches are the actual object in memory being locked, to acquire a latch the code must somehow obtain a reference (the pointer, the address) to the latch object. To obtain a lock the code has just to construct the proper 6 byte string describing the objetc being locked and then request the lock from the Lock Manager. Latches are acquired and released by the threads executing inside the process. Locks are requested and released by transactions. This is a very important distinction, as transactions can span several requests and execute on multiple threads (either concurrently, in case of parallel execution, or sequentially in case of subsequent requests being picked up by different workers). Locks are more complex than latches, not least because there are 22 lock modes documented in the Lock Compatibility MSDN chapter for SQL Server 2008 R2. Add cryptic names such as SCH-S, SIX or RX-U and is no wonder they seem such an arcane feature. Lets try to clear up a little bit what these various lock modes mean. While a query plan is being executed it is desirable that the objects referenced by this plan (tables, indexes) do not change structure (eg. drop a column from a table) nor vanish altogether. To prevent such changes all queries obtain upfront at the start of the execution a so called “schema stability lock” on all the objects referenced by the plan. This is the SCH-S lock mode. DDL statements will obtain the SCH-M lock (the schema modification) which is the most powerful (most restrictive, least compatible) lock mode there is, ensuring that no other statement can even reference this object. In practice most queries not acquire SCH-S mode but instead they acquire the equivalent data intent lock, like IS. The basic lock modes are S (shared), U (update) and X (exclusive). S and X are self explanatory. The U mode is acquired when inspecting a row that might be later updated or deleted (hence the lock may be upgraded to X). Acquiring U locks do not block reads, but blocks other queries from also inspecting the row for a potential update/delete. Without an U mode two queries attempting to update the same row would deadlock as they would both attempt to escalate the S mode to X mode. And having the update queries acquire directly X mode on all rows, even those that turn out not to qualify for the update, would result in unnecessary blocking of reads. All the lock modes that have an I in the name are intent locks. To understand what intent locks are you have to think at the problem of lock hierarchy. Consider a query that is going scan an entire table, of a few million rows. Acquiring individual locks on the rows will result in few million row lock requests, an expensive proposition. Yes,acquiring a lock is fast, but even fast adds up when repeated ad nauseam… So the query decides instead to lock the entire table and places on S lock on the table object rather than locking each individual row. Another concurrent query wants to delete the a row in the table so it requests an X mode lock on that row. And here is the conundrum: how is the Lock Manager supposed to know that it cannot grant the X mode row lock because the entire table is locked in S mode by another transaction? Remember that locks are just strings describing what is being locked, and there is no way the Lock Manager could know that the string describing the row requested in X mode happens to be a row in the table on which an S lock mode was granted. The solution is the intent locks. The operators requesting locks know the actual hierarchy of the objects involved: the update operator know that row it tries to update belongs to that table. So is the responsibility of the operator to request an intent lock on the parent object(s) in this hierarchy. The update operator will first request an IX mode lock on the table (“intent exclusive”) which can be read as a declaration: “I am not locking the table, but I may lock a row in this table in X mode”. This IX mode will not be compatible with the S (shared) mode requested by the scan that wants to lock the entire table so now the problem is solved by making the hidden conflict explicit, thus blocking one of the transactions until the other completes. So when you see lock modes like SIX you can understand it’s meaning: “I am locking the table in S mode and I may lock a row in this table in X mode”. Lock modes that contain an R in the name are range locks. Range locks are used to protect rows that do not exists. Key range locking is the mechanism used by SQL Server to obtain serialization isolation level between transactions (ie. no Phantom Reads). As serialization isolation requires that no new rows appear in a result set when a query is run repeatedly under the same transaction, the way to ensure this requirement is to lock not only the actual rows returned by a query, but also the entire range covering these rows so that concurrent INSERT cannot creep in new rows between the rows already returned by the first execution of the query. See Key-Range Locking for more details. The write operator is ‘positioned’ on the page that has to be modified (a row has to inserted, deleted or modified on the page). This means that the page must be ‘fixed’ in the SQL Server cache. The operator must obtain an exclusive latch to the page. This guarantees that no other operator can read this page. The operator must generate a log record describing exactly the operation is about to perform on the page and append this log record into the log. The operator can now modify the in memory cached image of the page. The LSN generated for the log record created before the page was modified must be written into the page header as the ‘last modified LSN’. The page exclusive latch is released. The page can now be read by any other operator. Is important to understand that until now no disk write occurred yet, everything is just modifications done in memory. Before the transaction that did the modification commits it must generate a new log record describing the fact that this transaction is committed, this log record is appended to the log and all log records in memory, up to and including this commit record, must be written to disk. By definition this will include above log record that describe the modifications done to the page. Note that the page is still only modified in memory and not written to disk. At this moment the transaction is durable because if the server crashes the modification done to this page is guaranteed to be described in the log, saved on disk, and the recovery process will redo this operation if necessary. Periodically the modified (‘dirty’) pages in the SQL Server cache are written to the disk. This is called a ‘checkpoint’. The operator doing the minimally logged operation (a bulk insert operator) allocates a new page. See Managing Extent Allocations and Free Space to understand how pages are being allocated. The operator ‘fixes’ the page in the cache and obtains an exclusive latch on it. A log record is generated describing the fact that the page is being used for minimally logged bulk insert. This log record is appended to the log (in memory) and the record LSN is written on the page as the last modified LSN. The page is added to a list of minimally logged pages associated with the transaction. The operator can now add as many rows as they fit on the page. I does not need to generate any log to describe each row. Only the in memory image of the page is modified, no disk write occurs. When the page fills up a new page is allocated and the process described above repeats. Before the transaction that did the minimally logged operation commits, all the pages modified in minimally logged mode by this transaction must be written to disk. After all the pages were written to disk, a new log record record describing the fact that the transaction committed is generated and appended to the log (in memory). All the log up to and including this last log record must be written to disk now. To prevent a ‘thundering herd’ phenomenon of all pages modified by the minimally logged operation attempting to write to disk at the same time at the end of the transaction an eager write process is writing them to disk even before the transaction is committing. After we sift out the query statements (including DML) and the DDL we’re left with a few special statements. BACKUP and RESTORE operates by bypassing almost everything we discussed so far. From a 10000ft view what BACKUP and RESTORE ultimately do is just a glorified copy from one file to another. BACKUP reads from the data and/or log files and writes into the backup file. RESTORE reads from the backup file and writes into the data and/or log files. They do need to do some housekeeping of system tables, but the bulk of work they simply read from a file and write into another. In doing so they bypass the data cache (the buffer pull). As for DBCC statements, pretty much each one does something different. For an example of how DBCC CHECKDB works I recommend reading the series of articles CHECKDB from every angle. Thanks, that’s well written and explained! Awesome Remus, very good indeed. If I can make a suggestion, I’d ask you to elaborate on how workers relate to schedulers. Can workers start executing on their own or they are always driven by a scheduler?